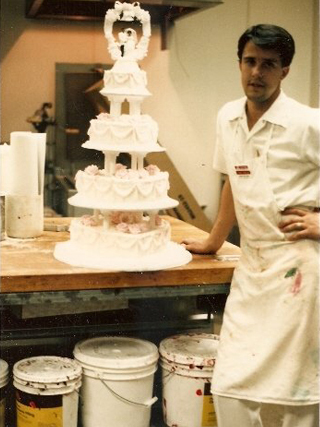 I have been in the Bakery business since I began high school in 1975. I would go into my Fathers bakery in Santa Maria, Ca and fry donuts before going to school. I worked there all through high school. In 1983 I started working with Ralph’s grocery store as a donut fryer and cake decorator in Bellflower Ca. Two years later I was a baker with Smith’s Food King in Granada Hills Ca. Two years later I was a Bakery Manager for Safeway food stores in Monrovia Ca. Three years later I was hired by the H.C. Brill company as a Bakery Technician, fixing problems in Bakeries. Three years later I took the opportunity to purchase my Father’s bakery in Santa Maria, and partner with my Brother. There I was able to really hone my skills as a baker and as a Cake Decorator. We averaged 5 Wedding Cakes a week. We were very busy. In 2003 I moved my family to Utah. I am an accomplished, award winning cake decorator. I am known and respected by my peers in the baking industry. Order your wedding cake with confidence that it will look beautiful and taste delicious.